Perfect location, delightful host. Very comfortable.Great parking. Charming apartment with wonderful old squeaky floors in a 18th century building. Add a warm welcome and a superb location — it is a just a few blocks to the main square and a few more to the Menin Gate. There is a little bakery selling tasty breakfast treats right around the corner. Nice meet and greet. Bottle of wine and chocolates. Nice store below with cafe. Bathroom/shower is a good size. Elevator for luggage. Family enjoyed their stay. I loved the place and liked that it had historical significance. Although the stairs were a plenty it didn’t take away from the charming and beautifully decorated residence. I will be back. Ypres was an unexpected beauty. Thank you Peter and Valery. Perfect location and within easy walking distance of the town. Clean and comfortable accommodation with everything we needed. Friendly and informative host who gave us information about the history of the accommodation and the area. Personal touches, including chocolates and wine were very much appreciated. Such a lovely apartment - so many homely touches. Amazing hosts!!! Proximity to all the town highlights was great. Lovely design touches. Interesting old building in historic part of town. Owner has shop below the apartment that looked lovely. The host (Peter) is a gentleman. Very welcoming and made sure our arrival was smooth. There was wine and chocolates in our apartment on arrival. The apartment is amazing, one of the few to survive the war. It has been restored to its former glory with attention to detail. Everything you need for a short stay is provided. A short stroll down the road, you find yourself in the main square of Ypres surrounded by history, restaurants, bars and shops. Truly a great stay, could not have asked for more. Fantastic appartments Clean an tidy well equipped kitchen loads of character, excellent host's, Good location, would go back tomorrow. The welcome Wine, Milk and Chocolate was a lovely touch. The apartment was a great size for a family and was beautifully furnished. Lock in a great price for Huis Vandermersch – rated 9.7 by recent guests! One of our best sellers in Ieper! Set in the heart of historical Ypres, 1,150 feet from the In Flanders Fields Museum and a 9-minute walk from the famous Menin Gate, the self-catering Huis Vandermersch offers an elegantly designed apartment with free access to wireless internet and parking facilities. The unit is fitted with hardwood floors, a seating area with a sofa and a dining table. There is a kitchen including kitchenware. The apartment’s bathroom features a shower and a toilet. Huis Vandermersch is within an easy walking distance from the city center which accommodates an array of restaurants, supermarkets, bars and shops. St. George’s Memorial Church is 1,300 feet away. Ypres Train Station is a 6-minute walk from Huis Vandermersch. Bellewaerde Amusement Park is 3.9 mi from the accommodations. The Belgian seaside can be reached in 23 mi. This is our guests' favorite part of Ieper, according to independent reviews. This property also has one of the top-rated locations in Ieper! Guests are happier about it compared to other properties in the area. This property is also rated for the best value in Ieper! Guests are getting more for their money when compared to other properties in this city. 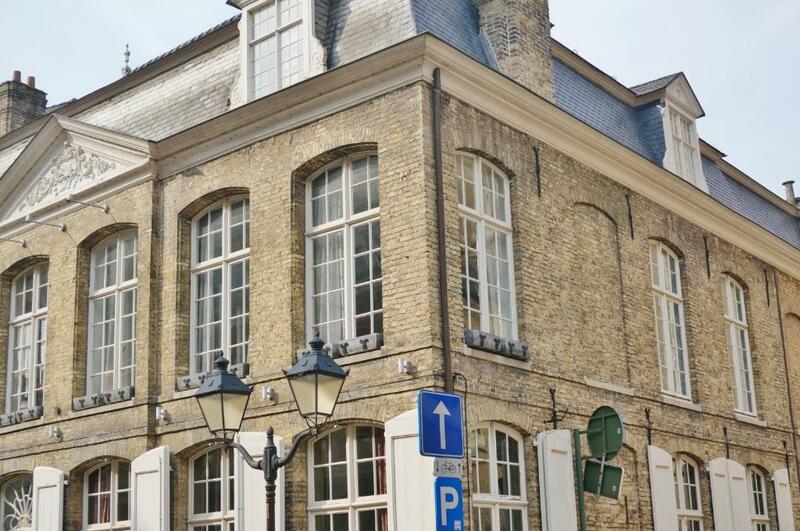 뀐 Located in the top-rated area in Ieper, this property has an excellent location score of 9.9! When would you like to stay at Huis Vandermersch? This apartment has a satellite TV, toaster and dining area. This apartment features a private entrance, kitchenware and electric kettle. House Rules Huis Vandermersch takes special requests – add in the next step! Please inform Huis Vandermersch of your expected arrival time in advance. You can use the Special Requests box when booking, or contact the property directly using the contact details in your confirmation. Forgetting the bottle of wine the host so kindly left us!